Infomancers say, “Good Morning!”: Where’s the conspiracy? “Infomancy” gains disapproving comment, but without substance. Olivier Le Deuff writes his views last week on the use of the word – and mine is not the only one – in Le matin des infomanciens (The morning of the infomancers) on his blog, Le guide des égarés (The Guide for the Lost). I am a little lost by his argument, but at least somewhat amused. Perhaps he thinks we infomancers wear delightful knitted costumes to practice our wicked ways? 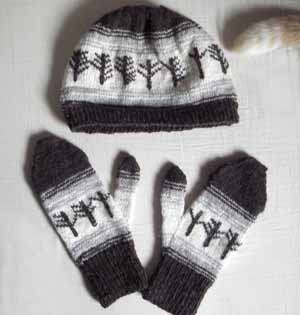 And just in case we’re having a bad day, the mittens spell “mittin” and the hat includes the word “hat”. You undoubtedly know Pauwels and Bergier’s book, le matin des magiciens [Ed. on the French-language Wikipedia; and see my comment at the bottom here. ], which although enthralling presents debatable, even doubtful, historical and scientific points of view. Well, I am currently working on the myth of conspiracy as informational object and I have noticed false resemblances between the skills exercised in information culture and the aptitudes prized by conspiracy theorists. Consequently, I have a little difficulty with the blog of teacher-librarian Christopher Harris, titled Infomancy. It is particularly the definition which bothers me even if it is tongue-in-cheek and the blog does not contain conspiratorial theses, as far as I have been able to see. There exist other sites like that of the British Peter Norrington [Ed. For link stability, I have changed this link to the home page] which goes back to 2003, but most interesting is that there also exists the project Infomancy.net (the Royal College of Infomancy!). In fact the site remains serious and is managed by a librarian in South Carolina, who seeks employment, and is especially interested in digital libraries. Besides that, the site does not seem very dynamic in spite of the associated blog but undoubtedly infomancers work in secrecy! What level should a response to this be at? Olivier is active in information-communication culture, so I shall offer a range of responses in the hope that one at least is appropriate. I could remark on misquotation of evidence. No doubt it’s an accident (I make those in my writing, I know). No, this is merely a gnat’s bite. I could propose explicitly invented conspiracy theories. If the Royal College of Infomancy is a little inactive? A.this has more to do with the loss of lifelong tenure in academia leading to the need to focus on one’s paying work. That would be too prosaic and, dare I say it, altogether possible! B. Or rather, we should fear that its so-called Royal nature is in name only, and that hidden, mysterious and (of course!) dark forces have discovered and acted upon the misappropriation of “Royal”. And these forces I can reveal in all their Britannic majesty! No, really there are other issues, and of significance. Olivier recognises the definition of “infomancy” given is tongue-in-cheek, and he recognises that the sites are serious in content. So, why not ignore us and, uninterested, let us have our fun? Or, disinterested, just comment on this unusual word and its unusual use, and pass on by? Make no mistake, this must not undermine the serious project for well-constructed information science, well-supported information culture and well-taught or acquired information literacy. So, no conspiracies here. Yet, this piece rests on work that is not presented, concerning unstated observations (of false resemblances between skills in information culture and conspiracy theorising). Thus, the absence of presentation (by quotation, citation or link) is itself as secretive as the work of the infomancers! Now, I must be plain that I have no doubt about those false resemblances – for various reasons, which I shall not reveal – even in the absence of Olivier’s work. However, I think we (“infomancers”, or less rhetorically, just I) might ask for recognition of humour, irony or oxymoron in the pursuit of serious ends. Meanwhile, are our neophytes and disciples (those would be our readers) not to be credited with some ability to grasp the point? Besides, his article has some curious points in information, deduction, inference, implication or rhetoric. Finding the others is an exercise for the gentle reader, as dealing with them here would be to overstate their importance. In the end, Olivier’s piece seems itself to require an application of some literacy, new or otherwise to understand it, its central argument intangible and unsupported. Being somewhat botheredby infomancy (or “infomancy”) doesn’t make a discussion. On one hand, there is a question – perhaps long, perhaps (very) short of answer – to be had about what infomancy means. On the other hand, although I am ultimately amused by Olivier’s piece, I may have missed his intended humour, or indeed point. The English version is published as The Morning of the Magicians (or The Dawn of Magic). Read BOTH the Amazon reviews: they are very, very different. The second review is in tone similar to the French Wikipedia link provided in the article. As books go, when published this one caused some spirited attack and defence! For what it’s worth, I agree with Olivier’s comment that the book “although enthralling presents debatable, even doubtful, historical and scientific points of view”. I read it as a teenager, was engaged by it while reading it, and moved on. Indeed, it seems that Conspiracy is the only feasible option here. The very inactivity of my site implies that I am weaving dark magics behind the scene! (or that I am lazy) Let us join, my brethren, in mancing info until we can no longer stand.